The Alaska Junction is the vibrant center of West Seattle with all its shopping and restaurant options. And one can imagine how trolley cars clambered down the streets a hundred years ago. There is the West Seattle Farmers Market every Sunday from 10:00 am to 2:00 pm right on California Ave. The Alaska Junction is also a major hub for mass transit where one can catch Metro's RapidRide C-Line for a quick trip to downtown Seattle and on to South Lake Union. For a more scenic commute, there is a free shuttle to the Water Taxi that zips across Elliott Bay between West Seattle and downtown Seattle. Homes in this area are a mix of large and small and span both sides of California Ave. It can be a very nice thing living close to The Alaska Junction, and one can more easily live without a car, if one desires. Restaurants are too numerous to mention here, from casual lunches to elegant dinners. Wind down Erskine Way into the neighborhood of Seaview where homes both large and more modest are lined along friendly level streets to sloping view terraces. Seaview is just west of California Ave, south of the Alaska Junction and north of the Morgan Junction. The Seaview neighborhood is a quiet pocket that is at the heart of much of what West Seattle has to offer. The Fauntleroy Ferry is a popular location for commuters and sightseers. Up the hill from Lincoln Park you can really take in the Puget Sound views. Homes here are oftentimes in the mid-century era, 50s, 60s, and some 70s. Another popular destination is the small shopping area about 4 blocks from the ferry where you will find Endolyne Joe's restaurant, a bakery, and a bed and breakfast establishment. And the trip across the water on the ferry is extremely picturesque. Gatewood is south of the Morgan Junction and runs west from 35th. It is a fairly large area of homes built along a gentle slope with many having nice westerly views. There is quite a mix of homes here, with some of the older ones being replaced by tall moderns to take even greater advantage of the views. Mass transit is fairly easily found here with Metro bus service on Thistle St and 41st Ave. Recently, Gatewood has been rediscovered as a great place to buy a home with a bit more space and view potential. Oh my, I must admit that I love Lincoln Park. The area has many smaller streets where traffic is nearly non-existent, and many homes sit amongst the shade trees. The park itself is an absolute gem, with expansive grassy areas, trails that wind along the bluff, picnic areas, and an exquisite beach with barbecue areas, and a beautiful walking path. And there is also a heated saltwater pool. Quite amazing. Fairmount is one of the smaller neighborhoods in West Seattle, and is centrally located just southeast of the Alaska Junction, north of the Morgan Junction and west of 35th Ave. The West Seattle Triangle is the gateway to West Seattle at the corner of Alaska and Fauntleroy and includes numerous restaurants, Rudy's Barber Shop, Trader Joe's, and the "coming soon" Whole Foods. The newly remodeled and enlarged Fairmount Elementary School is a nice addition to the neighborhood, and mass transit is super convenient. The neighborhood of Arbor Heights is at the southern end of West Seattle. Homes are definitely more affordable here, and I believe there will be good appreciation for homeowners and investors. Arbor Heights has always been a little out of the way for some, but it is being discovered by many now. It has been considered a bit of a sleepy area, but is now "waking up" a little with new construction and the brand new Arbor Heights Elementary School. This area is also served by Denny Middle School and Chief Sealth High School, both of which were recently built. Much of the area is flat with no views and affordable homes, but keep going west and you'll find spectacular water views. And also note, some of Arbor Heights is in the 98146 zip code, so please check that page as well. 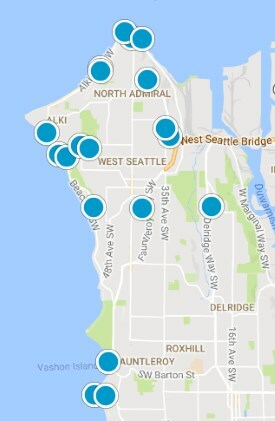 Let's talk about West Seattle real estate.